Paul started training in ECKA in 1992, achieving his 1st Degree Black belt in 1999, his 2nd Degree Black belt in 2005, his 3rd Degree Black Belt in 2008, and was awarded his 4th Degree Black belt in 2017. Paul started teaching by assisting at the age of 16, and then opened his Northampton club in 2008. 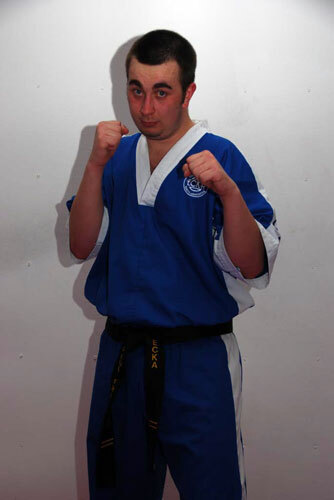 He has held coaching and instructor qualifications through the EKGB, the EKF and WAKO. He also holds a first aid qualification and is DBS checked. Paul also gained qualifications as an ABA Boxing Coach and Tutor. He started training under instructor Junior Anderson and has also trained with other notable martial artists; Sensei Dev Barrett, Bill “Superfoot” Wallace, Michael “Venum” Page. Paul has competed in Points fighting, Light Contact, Full Contact, Weapons and Freeforms/Kata. Paul is a Class B referee and is also a WAKO judge for Ring Sports. Paul teaches in Northampton and can be contacted by email: pauljfrancis@hotmail.co.ukor by phone on 07988 619159. The English Contact Karate Association – 87 Brays Lane, Coventry CV2 4DS.